If you've been hoping for a remedy for absent-mindedness, "senior moments," or even more serious memory problems, don't despair. 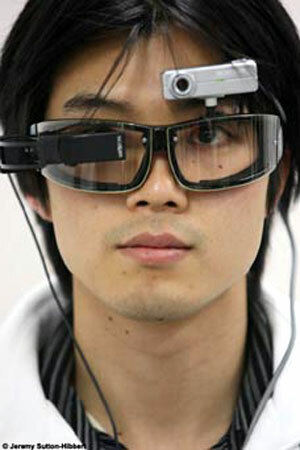 A rather fantastic solution is now being developed at the University of Tokyo called Smart Goggles. You may have seen similar glasses in science fiction movies. Smart Goggles can find your keys, your cell phone and your other perpetually missing objects. Moreover, this pair of glasses can locate important documents, valuables you've hidden but forgot where, and even your place in a book if you want them to. Smart Goggles can find your purse, connect a name and a face, and remember things you don't even know that you know. The team of research scientists working on the Smart Goggles at the University of Tokyo have a great vision for their device as kind of a second brain, one that can supply you with knowledge you were not even consciously receiving. What was science fiction, not too too long ago, is now science non-fiction. Smart Goggles consist of a pair of glasses, an attached camera, a viewfinder, and a small but powerful computer (worn on the back). The camera records everything you focus on. So you begin training the Smart Goggles by slowly walking around your environment so they can learn your space. While doing this you can focus specifically on items, like your keys and cell phone, that you may need regularly, and you name them as the Smart Goggle camera is recording them visually. By training its computer to get to know your space -- your office, your house, your car, maybe even your purse -- it will be able to find items in your environs when you need them. Then the Smart Goggles will start to recognize similar items in other places and identify them for you in the Goggles' viewfinder. You can even record people that you meet, identifying them to the Smart Goggles computer by name. So, thereafter, you will be able to connect the names and faces of people you've met. This feature will certainly help boomers and seniors who have difficulty in social settings because face-name connections become more difficult as we get into those age groups. Professor Yasuo Kuniyoshi, inventor of the Smart Goggles, says that his invention is not complicated from a hardware standpoint, but the success of the Smart Goggles was a matter of finding the right computer algorithm that allows the computer to immediately identify what the camera is seeing. With this technology, the Smart Goggle can learn to recognize items as well as people... to connect faces with names, even to recognize and retain information from cyberspace. Say, for example, you are looking at a picture of a rose on your computer. The Smart Goggles will not only identify the rose as a rose, but it will record all other information in the data on that page; perhaps its genus, species, color, soil conditions... If you later want information on a rose, your Smart Goggles' database will contain it. It will be recalled, and you will become known as robot brain! Seriously, the Smart Goggles will have, as Professor Kuniyoshi's research team intend, applications for the elderly, educational programs, people with a variety of sensory impairments, stroke victims, and Alzheimer's patients. Smart Goggles is a technology to keep your eye on. Gear Up For The 2013 International Sustainable Electronics Competition! What happens when you lose the goggles?